Chillie is very playful, and a bit of a mischievous flirt. She knows that she's flirting, but acts as if it's on accident. However, since she's no longer single, she only does it to Gem. Often she does this order to get favors from him. Apart from that, she's very independent and isn't afraid to speak up or defend herself. She really doesn't like it when anyone hits on her. Chillie is the spirit of a very young girl who was murdered in the middle of winter. She used to have a trainer other than Klaww, and defeated the entire Johto League single-handed. After that, her previous trainer left her in the lowest part of Shoal Cave and abandoned her there. She has been divorced twice. 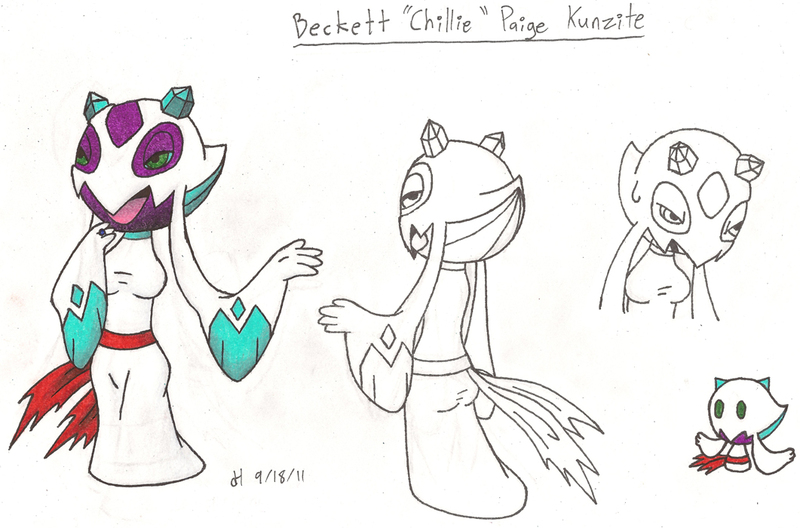 Currently she is married to a Sableye named Gem, and has a Sableye daughter named Jewel, of who he is the father. She's roughly half the size of the average Froslass, possibly due to the very young age at which she died. Besides that, though, she is very attractive. Obviously. Because I needed to make her design easier to draw. Backstory/History: Chillie is the spirit of a very young girl who was murdered in the middle of winter. Personality: Chillie is very playful, and a bit of a mischievous flirt. She knows that she's flirting, but acts as if it's on accident. However, since she's no longer single, she only does it to Gem. Often she does this order to get favors from him. Physical Description: She's roughly half the size of the average Froslass, possibly due to the very young age at which she died. Trivia/Details: I have changed Peril, Grievous, and Chillie’s design so that their eye colors all match Gem’s. Klaww’s already matched. Chillie's sash used to be green before I changed it. Pr0nz-related: Very experienced in bed.